Today’s blog is dedicated to the people of Paris, France. I hope the injured are able to recover quickly and that the people who lost loved ones find peace. I am told that Paris is a wonderful city and I hope the people who live there feel safe again soon. Hi everyone! After yesterday’s news, I thought it would be nice to research some nice French bats. I went online and found some really cute ones. A lovely portrait of a European lesseer mouse-eared bat. Photo by Rodrigo Lopez Sandln. One of them is the Lesser mouse-eared bat (Myotis blythii). This adorable little bat has soft brown fur that is lighter on its underside and head. They have a very long tail. Lesser mouse-eared bats like to roost in caves and buildings. They love roosting in church steeples and bell towers. One thing that makes the Lesser mouse-eared bat so special is how it can hover to catch its prey. It will hover in tightening circles until it finds its prey. Then it hovers behind the insect and plucks it off blades of grass. 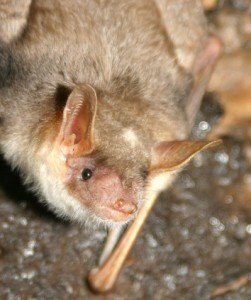 You can read more about the Lesser mouse-eared bat here. Another bat that lives in France is the European free-tailed bat (Tadarida teniotis). This is obviously Freda’s favorite French bat. She thinks they are cousins. They might be, but they definitely have a lot of differences. The European free-tailed bat is one of the largest bats in Europe. They have large forward-pointing ears that curl inward at the edges and they have the cutest long wrinkled muzzle. I think they look a little like they have a scruffy beard. They have long tails that extend beyond the flight membrane. Most bats don’t have tails that long. 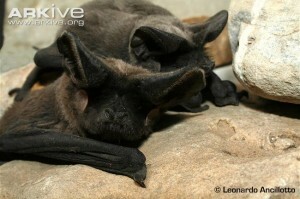 The European free-tailed bat has long fur, particularly on the throat. The fur is usually gray on the top of its body and paler underneath. Its wings are also grayish-brown to black in color and are really long and narrow. The shape of their wings gives them the ability to fly long distances. The European free-tailed bat likes to live in grasslands and shrublands. They like to roost in fissures and hollows in rocks and sea cliffs. They also like to live in bridges, water towers, cathedrals and other tall buildings. I think they are adorable! You can read more about them here. Next StoryHave a drink on me!